As an esteemed name in the relevant industry, we are providing a precisely processed assortment of Non Woven Zipper Bag. Following industry defined guidelines, we use contemporary machines and optimum grade raw material. Moreover, post production process, the entire range is thoroughly inspected upon a series of parameters. In line with clients' various demands, we provide the entire range in a wide range of designs, colors and customized option. Established in the year 2012, in Surat (Gujarat, India), we “Mani Techni Tex” are a reckoned Manufacturer and Supplier of Non Woven Bags, Non Woven Fabrics, Shopping Bags, Non Woven Surgical Face Masks and Non Woven Fabric Shoe Covers. 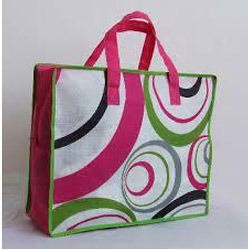 As per the set industry standard norm, these bags are designed using high quality basic material and latest technology. Acknowledged for their unique features like light weight, perfect finish, high strength, fine stitching, recyclable and water resistance, these bags are highly demanded in the market. In addition to this, we also provide Non Woven Fabrics to our clients. The offered fabrics are woven using high quality fibers and latest machinery as per the latest market trends. As per the requirements of our clients, we provide these bags and fabrics to our clients in different sizes and colors.